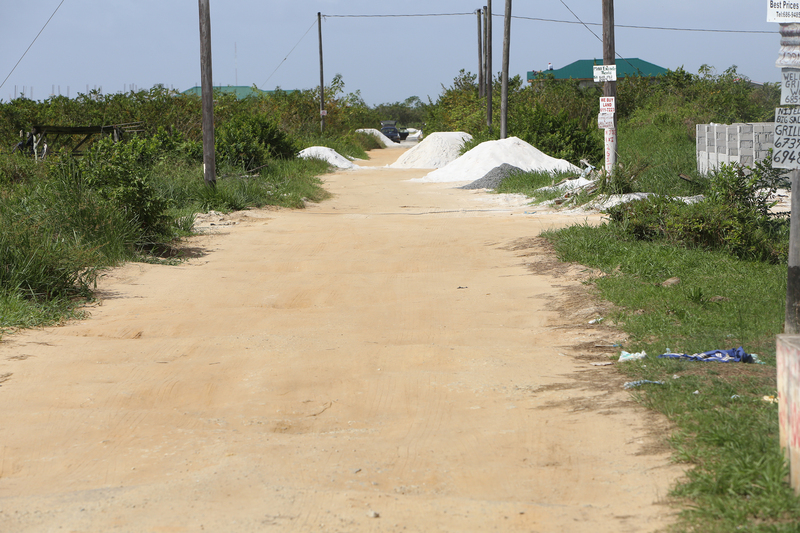 This is a roadway in the new scheme at Herstelling, East Bank Demerara. These two women could be seen manoeuvring around holes as they made their way home. Within the last decade several large housing schemes have been developed along the East Bank corridor and while many are thankful for house lots there are increasing concerns about the police’s ability to respond promptly to reports of crime because of the few signs and their unfamiliarity with the areas. 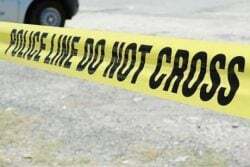 An armed robbery at Plantation Providence, East Bank Demerara last month has exposed the police’s unfamiliarity with the area and this may very well apply to other schemes such as EE Eccles, Herstelling, Farm and Covent Garden. Though these schemes collectively house thousands of people, there are still many lots which are unoccupied and covered with tall grass which makes them the ideal hiding place for bandits. The deplorable state of the roads is also of concern since a police vehicle or a fire tender would take a lengthy time to get from one end to the next. In the case of the police, the criminal would make his escape with ease particularly if he is on foot, a bicycle or a motor cycle. 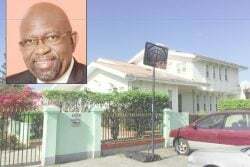 Observers are now questioning whether there is a relationship between the Central Housing and Planning Authority – the entity which allocated the lands – and the police. This is the state of a road in the new scheme at Providence. Residents say that police would be unable to pursue a criminal and the fire tender would be unable to reach a fire scene in a timely manner. This is the road leading from Fourth Bridge, Herstelling. Residents say that when it rains they have to play hop scotch to get in and out of the area. This road in Herstelling is filled with countless holes. The ride in a car would be a very bumpy one. This is the roadway leading from the East Bank Public Road into the new scheme at Farm. 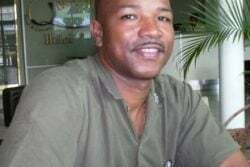 CH&PA’s Chief Executive Officer (CEO) Lelon Saul says that if a request is made, housing plans will be shared with the police. “Did the police request it? 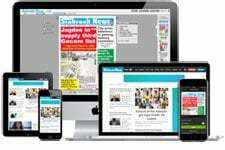 Certainly it will be given to them”, he said during a recent interview with Stabroek News. Prior to speaking with Saul, Stabroek News visited the five schemes and spoke with residents who while outlining their concerns, were adamant that the availability of the area plans would make it easier for the police to man the area and to reach places where a crime had been committed. The Providence Police Station and an outpost at Mocha (located behind Herstelling) are the closest police presence for these schemes. 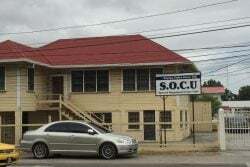 Farther up the East Bank corridor there are police stations at Golden Grove and Grove. Saul told this newspaper that the Authority’s housing plan has not been shared with the police. He said that the police force is responsible for public security and therefore the police “ought to know the directions to locations. They should make it their duty to know. They cannot say that they don’t know”. He advised that the police make it their duty to get the plans from the Authority or use tools such as google maps which would show all the streets in a particular area. Saul made it clear that there is nothing that prevents the Authority from sharing a scheme plan with the police but it has to first be requested. During the visit to EE Eccles, a resident said that the lack of street names is a major impediment to the police. 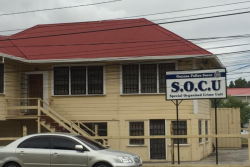 The businesswoman who requested that her name not be published told Stabroek News that if the police respond to a report, the victim has to direct the ranks by street. “If you call de police you gotta tell them come down First Street or Second Street or whatever street you living pon. If the police count wrong then is the wrong street they will turn down”. The resident stressed that “if you lose track of where you going is lost you gon get lost cause this place big bad”. She said that she has been living in the area for the past four years and she is afraid for her safety. The woman said that aside from the streets not having names, several are incomplete. A drive around the area confirmed the woman’s claim. Some streets were in a deplorable state. Tall grass has encroached on some of the roads making them narrow. The woman noted that making the area plan available to the residents as well as ranks driving and walking around to familiarise themselves with the scheme would be helpful. She like several other residents living there said that there are regular robberies in the area particularly at nights when persons are heading home. During the day she said homes are broken into. 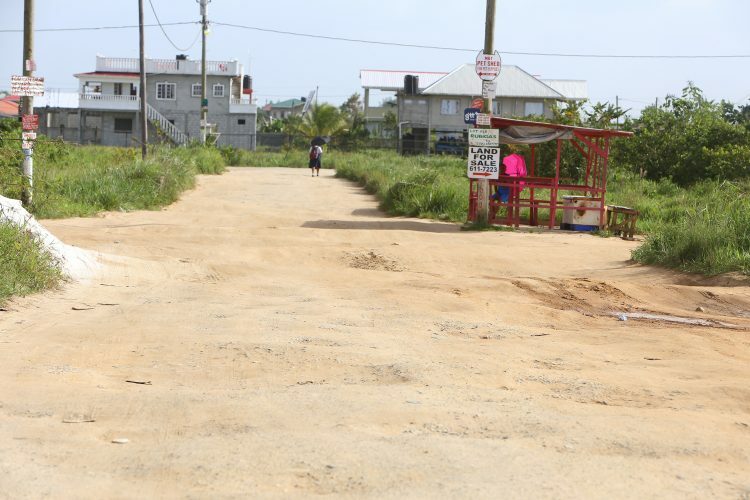 With regard to the naming of streets, Saul explained to Stabroek News that residents can petition the neighbourhood democratic council in their area to name streets. “For example if you are living in Eccles and there is no street name, you can petition the Eccles/Ramsburg Democratic Council. You can come up with names and suggestions for your street”, he said. None of the other four schemes have street names. In fact, the main streets in Herstelling are identified by the bridges – First Bridge, Second Bridge, Third Bridge and Fourth Bridge. 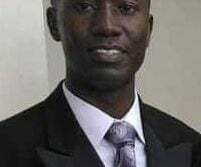 According to Saul, most of the schemes have not been handed over to the Neighbourhood Democratic Councils (NDC) and as such the maintenance of roads and the installation of electricity and water falls under the Authority. “We’re presently working on MoUs to hand over those schemes or part of those schemes to various Local Democratic Organs along the East Bank corridor”, he said. Regarding empty plots, Saul said that the Authority is encouraging allottees to build soonest. In future, he said it is the Authority’s intention to strengthen the conditions of sale. 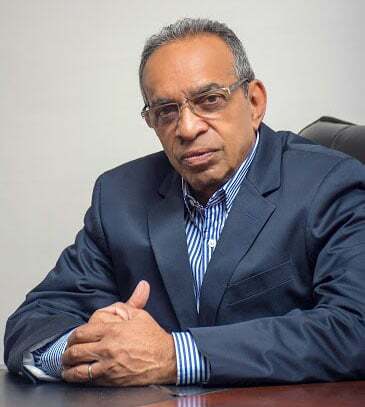 “As we move forward we will put more stringent measures in the condition of sale so if you do not build within a given time it will make it much more easier for us to repossess your lots”, he said. He added that the present laws make it difficult to repossess those empty lots. “The time it will take…because you have to go through a long judicial procedure and based on the advice I have received, maybe we need to relook at the terms and conditions”, he said. A resident of Herstelling lamented the challenges she faces to get to her home at Herstelling. 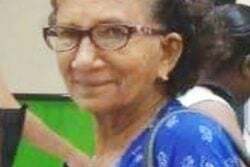 Stabroek News met the woman at Mocha road head where she was awaiting transportation to take her home. She explained that it cost $100 per man to get to Herstelling but because her road is in a bad state, she has to pay $500. At the time she was with two other occupants of her home. 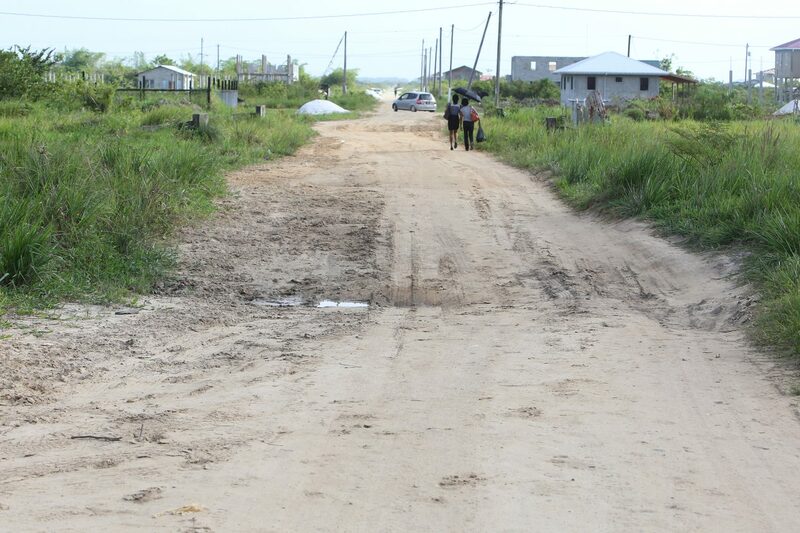 She informed that she has been living in the area for the past two years and because of the ongoing construction of nearby houses, the road has gotten worse. “People really punishing a lot in here”, she said while noting that having to regularly pay $500 to get home is burdensome on her. 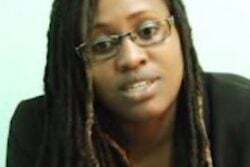 Like many other residents, she stressed that government ought to ensure that systems are put in place to ensure the safety and comfort of residents. She said that the police would have difficulty patrolling roads in their present state. “Taxi don’t always want to take me home because of the street”, she stressed, the frustration showing on her face. Another resident living in that area said that every two months she has to be buying car parts. “They gotta do the roads man. When it rain it worse…the children and everybody got to be doing hop scotch”, she said. The resident indicated that she raised the issue earlier this year with the Ministry and was told that because of the upcoming May/June rains it made no sense to grade the road. She said that that time has passed and another rainy season is approaching. “So is back to hop scotch for all ah we”, she stressed while adding that she remains hopeful that at some point the roads in the community will be fixed. A taxi driver operating in the Herstelling area said that traversing the community is often difficult because of the state of the roads. He said that he has been using his car as a taxi for the past year. “It is very difficult when it rain. The car does cut out when it go in them big hole that full ah wata”, the man said. He noted that about 10 cars operate from the Mocha road head. Residents of Farm and Providence had similar complaints. 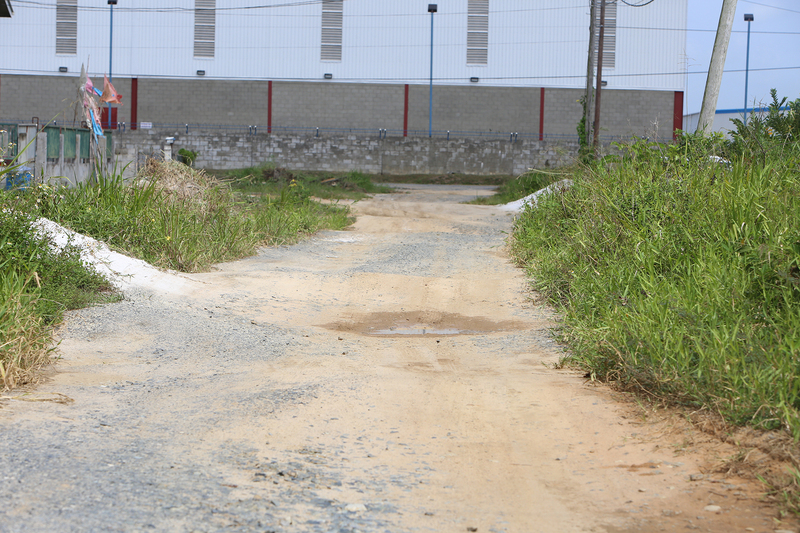 Stabroek News observed huge holes in the roads. One is unable to drive comfortably on very few roads. 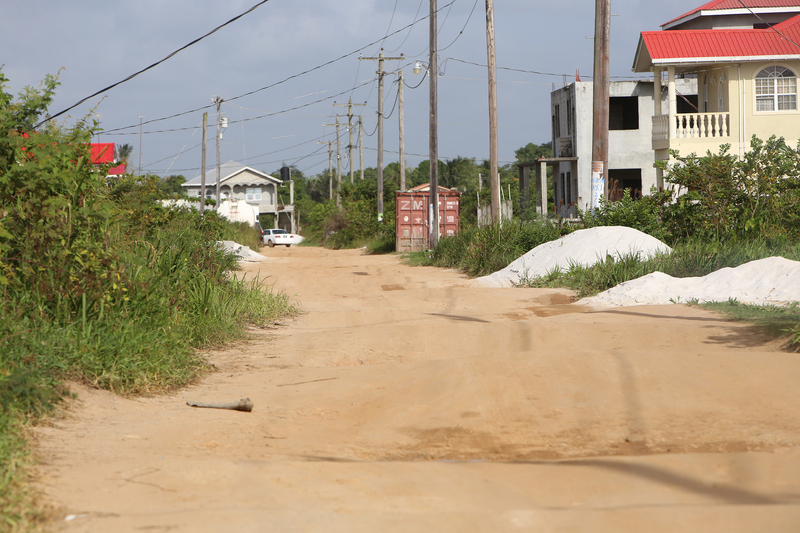 One resident of Provi-dence said that though her street is bad, a police patrol would pass once a week. Residents in none of the other schemes made mention of police patrols. Asked whether the Authority intends to ensure that the roads are fixed before the schemes are handed over to the NDCs, Saul informed that “the development of the schemes are done in an incremental manner and some of those roads we are working on presently to improve the conditions”. Lights and water for Farm is progressing, he said, adding that the Authority has already mobilized some of the resources – posts and transformers while the electrical cables are being shipped from China. He said that in a short while the tender for the electrical network will be awarded. 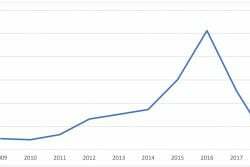 The NDC is responsible for street lights.